Our most affordable binocular microscope! With great features like top & bottom LED lighting, coarse & fine focus, and DIN objectives this is a microscope that you can grow with. Features dual 10x WF eyepieces. 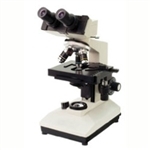 This user-friendly Walter Series 30 binocular microscope is excellent for high school students interested in viewing slides. Students will benefit from the many features, including binocular head, mechanical stage, separate coarse & fine focusing, a reversed nosepiece, 4 DIN objectives, iris diaphragm and LED lighting. For extensive lab use in today's clinical and research setting. This microscope model provides five objectives and interchangeable condenser system which applies to bright field, phase contrast, dark field and polarized light techniques. 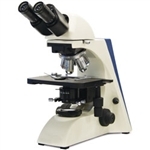 Our professional binocular microscope incorporates all the best features of a quality laboratory instrument. The objectives face backwards for more space and the base has a comfortable plastic plating over the metal for less heat conduction. Our new Infinity Microscope provides optical performance ideal for extensive lab use in clinical and research settings of biology, histology, pathology and medical chemistry. Outstanding design features include a contemporary ergonomical body, wide mechanical stage which can hold two slides for easy comparison and a frontward mounted-pull hatch condenser for easier light bulb changes. Designed to meet the demands in education and training environments, the new 1000 series with infinity optical system will deliver the best performance for a variety of applications. The 8000 Series has highly crafted optical and mechanical standards in both material and workmanship. Equipped with planachromatic objectives that give true near-to edge focus and detail. Designed to meet the demands in education and training environments, the new 2000 series with infinity optical system will deliver the best performance for a variety of applications. Its unique focus control system has standard coarse and fine focusing on one side while the other side has finger adjustment out of the way of the mechanical stage.